If you listened to this podcast, you know it was a bit of a rogue endeavour, an attempt to make something that didn't yet exist. It was sometimes successful and sometimes it wasn't. It had a great theme song. Some people seemed to like the show! But like many things in the arts, it was hard work and simply didn't have what it needed to sustain it. People were generous with their time, their opinions, with sharing this show. All of this continues to surprise and delight me, but there was no supporting infrastructure to make this work. Thank you to those who engaged with it. This website now serves as an archive for the show, which ran from 2014–2015. Brendan Fernandes, Encomium, 2015. Performed by Damian Norman (left) and Sky Fairchild-Waller (right). Photo Henry Chan. Resulting from a keynote performance and subsequent panel discussion at OCADu Graduate Conference, The Multiple Li(v)es of Art/ists &... Disciplinary Fuziness and the Future(s) of Art Criticism, this month's episode explores the work of New York-based Canadian Artist, Brendan Fernandes. Probing Fernandes's experience as an artist and a dancer, this episode also documents Encomium, a performance which circles hybrid themes of identity, love, labour, and public space. Listen to Episode 7: Brendan Fernandes here. On January 7th, 2015, I set out to see and review every show that sent me a press release and had gallery hours that day. I saw 8 shows across Toronto, hoping to chronicle the city’s artistic ecology and perform the frantic activities of critical judgement at a rapid pace, with little time for reflection. I livestreamed my in-gallery conversations with myself, and recorded them for this episode. Included here are review of “NEXT” at Arsenal, Giles Round, Lis Rhodes, and Tiziana La Melia at Mercer Union, Elizabeth Babyn and P. Roch Smith at loop Gallery, Allison S.M. Kobayashi and Christine Swintak at the Artscape Youngplace Hallway Galleries, Xiaojing Yan at Red Head, “Besides, Your Neighbours” at 8eleven, Suzy Lake at the Art Gallery of Ontario and “TEMPERAMENTAL” at the Doris McCarthy Gallery. Listen to the entirety of Episode 6: The Mobile Critical Marathon (or individual reviews) here. I tweeted @WILLpodcast, using the hashtag #mobilecrit. I also livestreamed the entire performance on mixlr, which you can listen to a fractured archive of at Mixlr. Regionalism is a perhaps-necessary complication in a huge country divided by arbitrary borders. But it's also contentious: what does the place we make work say about the kind of work we make? Episode 4: Regionalisms features contributions from Amber Christensen and David Yu attempt to untangle regionalism's hold on Canada. What do you like? What does everyone else like? Are there things you think you like only because you like them that might, in fact, be tastes bred into you by the subtle forces of social coercion? Is art a numbers game? Should it be? What is your responsibility to understand yourself and the way you think about art? This week, What It Looks Like teams up with the fledgling organization CIASK: the Canadian Institute for Art and Self-Knowledge. Download the form-fillable PDF and follow along with the episode. Inuit art has a huge role to play in the art market, especially in Southern Canada. It's to be found in major museum collections, the homes of private collectors, and commercial galleries. It seems like everywhere you look, some website is trying to sell you a soapstone carving. But how much, in the South, do we know about Inuit art? In Episode 3: Inuit Art we discuss information and misinformation, repatriation, artistic practice in Northern Canada, and the role of Inuit art's extensive markets. This month, we talk about the confines of the professional, and the things that lay just outside those confines: day jobs, religion, biography, internships, scandals, rejecting an art-making formula, and the things that happen in the meantimes and in-betweentimes of art careers. Artist Wanted, a collective of Rodrigo Marti, Rita Camacho Lomeli, and Wing Yee Tong, began as a group talking about the realities of labour in Toronto's arts communities. This month, we talk about what they made, where they got with the struggle to work through labour issues in the arts, and what is to be done next. Sky Glabush, whose exhibition, "Display," runs until April 26th at mkg127, makes work he worries will alienate his viewers: work about religion, about his biography, about the place of spirituality in modern systems of knowledge. He also has some pretty wonderful career advice, which he shares in Episode 2: Unprofessional Development. For our inaugural episode, we wanted to start with the basics. But frankly, everyone's bored of talking about what "counts" as art and what doesn't. Here are two stories about art encounters that resist categorization, where people find themselves forced to answer just that ever-hated, mind-numbing question: what is art? 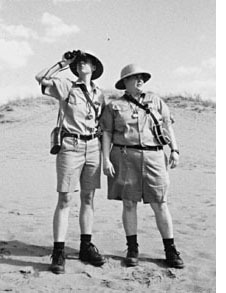 When Kaari Sinnaeve was just a spring chicken, starting her undergrad at the University of Winnipeg, she was lucky enough to encounter Shawna Dempsey and Lorri Millan-- the Lesbian Park Rangers. This week, they grace us with their official presence in Episode 1: What is Art? Toronto, you're lookin great from inside the @gardinermuseum! An eerie install detail of Scott Rogers's work at YYZ Artists Outlet. @sky_gl is one of my interviewees this month on the podcast! His show, display, is up at mkg127. And it's gorgeous and strange. Met with Artist Wanted and they showed me these mind maps they made about labour and precarity. Amazing. Aaaaand there it is! Now searchable on iTunes. It's tagged explicit because Anthony Cooper of VSVSVS got a bit riled up about lineups and dropped the f-bomb. But next to these religious podcasts, that E looks positively scandalous! Peter Schjeldahl's talk is about to start. The place is packed, and the spotlight's like a sunrise. Regram from myself (double-gram?) @snowcooley -- The podcast launches Monday! How will art make you puke today? Find out in Episode 1: What is Art? in an interview with Toronto-based collective, VSVSVS. Ep. 1. What is Art? What It Looks Like was a podcast about art in Canada. It ran from 2014–2015 and was independently hosted and produced in Toronto. Through a combination of storytelling, exploration, interviews, and artist projects, the show was an experiment in finding accessible ways to communicate art's big (and little) ideas. Connect with us on facebook or twitter, or join our mailing list for regular show updates.